LIE #1: John McCain isn’t a loyal Republican. TRUTH: McCain has been a stalwart Reagan Republican since he first entered politics in 1981. He has never backed Democratic candidates for president or lesser posts – other than supporting his friend Joe Lieberman in his Independent campaign for US Senate in 2006. Over the years, he has campaigned tirelessly for Republican office-holders in every corner of the country – including vigorous campaigning that helped win elections for his former rival George W. Bush in both 2000 and 2004. McCain has earned a lifetime rating of 83 for his Senate voting record from the American Conservative Union; his friend, Fred Thompson, won a very similar lifetime rating of 86 and appropriately dubbed himself “a consistent conservative.” While some of McCain’s harshest critics regularly talk of abandoning the GOP for some third party option (and some did so to back Pat Buchanan’s embarrassing run in 2000), McCain has never abandoned his party. On three crucial items in the Bush agenda – taking the offensive against terrorists, cutting wasteful government spending, and comprehensive immigration reform – no member of Congress has provided more loyal or significant support for the President of the United States and the leader of the Republican Party. 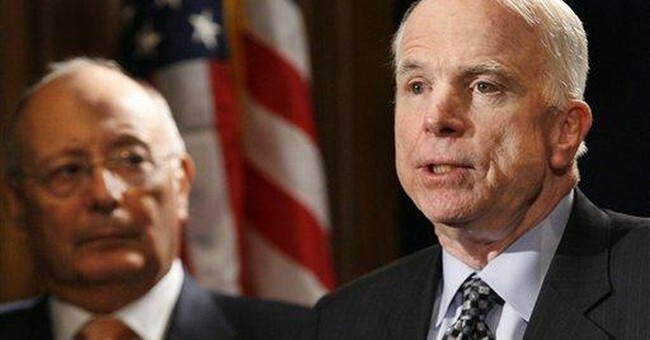 LIE #2: McCain represents a betrayal and rejection of the Reagan coalition. TRUTH: McCain is a consistent, passionate Reagan Republican who, like the greatest president of recent years, is unabashedly pro-life, pro-second amendment rights, pro-military, pro-peace through strength, pro-small government, pro-spending cuts, and pro-tax cuts. Many leaders of the Reagan Revolution – Jack Kemp, Senator Phil Gramm, Senator Dan Coats, General Alexander Haig, George Shultz and many more – proudly back Senator McCain. The conservative Senators who know McCain best – John Kyl, Tom Coburn, Sam Brownback, Lindsey Graham, Trent Lott – support his presidential campaign after working with him in the Senate for years and seeing his commitment to Reaganism. During the six years he served in Congress under President Reagan, McCain supported the administration as one of its most effective “foot soldiers.” Unlike many of his critics, McCain echoes the Reagan approach – not the Buchanan approach – to free trade and immigration reform. LIE #3: John McCain organized “The Gang of Fourteen” to Block the Confirmation of Conservative Judges. TRUTH: John McCain organized “The Gang of Fourteen” to win- not to block -the Confirmation of Conservative Judges, and his efforts succeeded in the Senate. This group of seven Republicans and Seven Democrats (representing a full 14% of the US Senate, obviously) ultimately broke the logjam that had delayed confirmation of some of the most conservative nominees of President Bush. Because of McCain’s leadership, Chief Justice John Roberts and Associate Justice Samuel Alito won Supreme Court confirmation without filibuster from the Democrats. He also secured the previously blocked confirmations of Appellate Judges William Pryor, Janice Rogers Brown, Priscilla Owen, and Brett Kavanaugh, previously filibustered by Democrats. At the same time, McCain and his “gang” managed to protect the right to filibuster – an important tool with obvious value now that Republicans find themselves in the minority. McCain has never opposed a Republican nominee for the Supreme Court; unlike some of his prominent fellow Republicans, he actively supported the nomination of Judge Robert Bork. His disagreement with Senate Republican leader Bill Frist on the “Gang of Fourteen” issues involved questions of tactics, not the goal of securing a judiciary that honors the principles of strict construction. LIE #4: John McCain supports higher taxes. TRUTH: John McCain has never voted for an increase in tax rates in 25 years in Congress—never – and clearly and consistently supports cutting and simplifying taxes. Grover Norquist of Americans for Tax Reform has acknowledged that even though McCain refuses to take the “no new taxes” pledge he has kept that pledge with his voting record, throughout his service in the Senate and the House. Yes, he did vote against Bush tax cuts – but did so because no cuts in spending accompanied the cuts in taxes. Unlike some of his colleagues, he insists that tax cuts and increased revenues won’t be enough to close the deficit – there must be spending cuts as well. It’s increasingly obvious that he’s right: tax cuts without spending cuts won’t shrink the national debt or trim the size of government. He currently supports making all the Bush tax cuts permanent before their schedule expiration in 2010 to allow individuals and businesses to plan their futures without uncertainty. He also backs an immediate cut in the corporate tax rate from 35% (second highest rate in the world) to 20% (one of the lowest in the world) as a means of stimulating the economy and creating jobs. He also backs instituting new rules requiring a super majority – a three-fifths vote of both houses of Congress-- rather than simple majorities, to approve any tax increases. This would make it vastly more difficult for future Congresses (even under Democratic control) to take more money from hard-working Americans. TRUTH: As Senior Senator from Arizona, McCain has fought for years to tighten border security, stop illegal immigration, increase workplace enforcement and to resist “amnesty” for those who entered the country without authorization. Of course, this discussion only begins to scratch the surface when it comes to the smears and distortions against Senator McCain from some of his long-standing foes in the Republican establishment. Fortunately, the Senator himself is getting more opportunity to speak directly to the American people, above the heads of the talk radio hosts who are leading the hysterical charge against him. McCain’s critics have every right to prefer other candidates, or to reject his increasingly powerful bid to unite the party and defeat the Democrats in November. They are wrong, however, to lie about his policies, his principals, his record and his character. Instead of the endless concentration on distorted reasons to dislike McCain, the complainers should concentrate on the basis for admiring the candidates they do support. The Republican Party would benefit from an open, honest debate about the virtues of the various candidates that make them worthy of support, rather than incessant and self-destructive focus on alleged vices of the front-running candidate that make him worthy of contempt. Again and again in his 25 years in politics, John McCain has risked his career to provide straight talk to the American people. Those who claim to cherish the integrity of the conservative movement owe it to their party and their country to talk straight about all four of the excellent candidates remaining in this race.